I got home safely from Oz a few weeks ago, but I've been waiting until my photos came back and I had something to post. I thought it would be great having a digital camera and being able to take an almost unlimited number of pictures, but ever since I got back, the whole thing has been a nightmare, with one problem or screw-up after another. The camera quit working completely after the batteries died, and then there were a couple of corrupted files on my StupidMedia card (my name for it), which corrupted the rest and prevented them from being downloaded. Then the whole card got reformatted by accident when I was trying to pull up the photos in a camera. Now it's up to some data recovery wizards who claim they might be able to save the lost files. If they can rescue anything, I will definitely post photos online. After doing a free intro SCUBA dive in Australia, I decided to get certified once I got home, and I'm taking the classes this week. 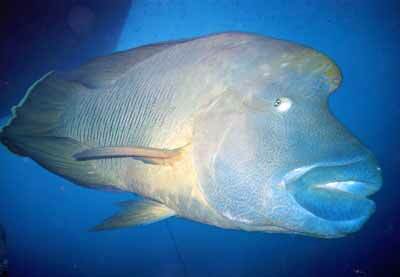 Now I can go back and see Wally the Napoleon Maori Wrasse again! I'm going to post a photo of Wally that I found on the internet. He's a remarkable fish, and a lot of travelers seem to have taken pictures - there's even a site with a little QuickTime movie! Just type in "Wally wrasse" into Google, and check out all the sites!